© EPA A vigil is held for Jamal Khashoggi in Istanbul, as pressure is piled on the Saudis over his killing. Saudi Arabia’s foreign minister has described the kingdom as a “vision of light” in the region as it tries to control the fallout from Jamal Khashoggi’s killing – its biggest diplomatic crisis since the 9/11 attacks. After more than two weeks of international outrage over the journalist and dissident’s death, Adel al-Jubeir sought to portray the country as the moral beacon of the Middle East, in stark opposition to Iran, Saudi Arabia’s arch-rival. Condemning the media coverage of Khashoggi’s killing as “hysterical”, Jubeir rejected a call from Recep Tayyip Erdoğan, the Turkish president, to try the 18 suspects in Turkey, stressing that they would be “held accountable” on Saudi soil. Saudi Arabia has changed its story a number of times when trying to explain what happened to the Washington Post columnist who disappeared during a visit to its consulate in Istanbul to pick up paperwork he needed to remarry. After a succession of denials that Riyadh had anything to do with his disappearance, the kingdom eventually admitted that Khashoggi had died, but said it was in a fight with Saudi officials who had embarked on an unsanctioned extradition operation. 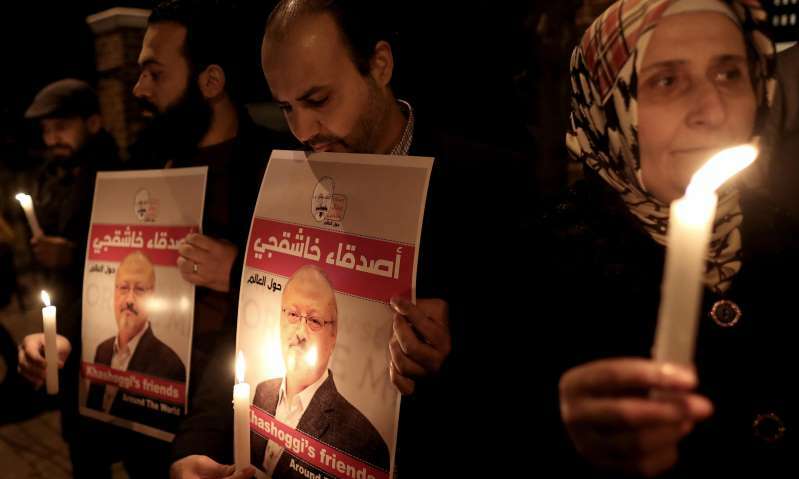 Riyadh later updated its version of events to say that evidence from Turkish investigators indicated that the killing had been premeditated, but maintained that his body had been wrapped in a rug and disposed of by an unnamed “local collaborator”. Istanbul police say that Khashoggi was tortured and then murdered, and his body dismembered with a bone saw. Woods and farmland outside the city have been searched, but his remains have not been found. Erdoğan reiterated during an address to parliament on Friday that Riyadh must disclose the location of Khashoggi’s body and identify who ordered his killing – a sign that Ankara is willing to keep up the pressure on the beleaguered kingdom and its de facto ruler, the crown prince Mohammed bin Salman. Khashoggi’s killing has severely damaged the heir to the throne, who many believe must at a minimum have been aware of the Saudi operation, which involved several members of his personal guard and other senior officials. It has also proved a major test for the Trump administration. The White House has put the young prince at the heart of its Middle East policy, key for both combating Iranian influence across the region and brokering an Israeli-Palestinian peace deal. President Donald Trump has hardened his stance on the matter in the past week, calling it the “worst cover-up in history”, while at the same time emphasising Saudi Arabia’s role as America’s most important Arab ally and the value of US arms sales to the country. Jim Mattis, the US defence secretary, who also spoke at the summit in Manama, said that Khashoggi’s killing had “undermined regional stability”. Washington was considering additional punitive measures against those responsible after issuing visa bans for the suspects in the case, Mattis added.